With extensive first-hand experience in the skincare industry, we’re no stranger to tools and gadgets designed to improve the appearance of skin and increase a woman’s confidence with daily use. Over the years, we’ve seen countless accessories hit the shelves, each one promising to make skin younger, brighter, and more hydrated than ever before. Unfortunately, marketing messages, while powerful, can also be misleading. Not only can an effective campaign convince the consumer that their life will improve with the new product to hit the market, but small-print disclaimers will also deflect any responsibility if (or when) the product doesn’t do what it says on the tin. If the product doesn’t work or uphold the promises made in the advertising campaign, there’s not a thing you can do about it. Now as you know, we love to share our inside industry knowledge with our followers, so we’ve road tested some of the more popular skincare tools and accessories to make sure you end up with fabulous skin and NOT a drawer full of gimmicky – often costly – skincare tools. Keep reading as Biologi’s dermal therapist, Lucy Kuper, shares her professional opinion on some of the trendiest tools on the market. Face halos are a relatively new addition to the skincare market only gaining popularity in the last 12 months or so. The face halo is a reusable makeup remover pad that gets rid of all traces of makeup with water only. No chemicals. No harsh wipes. Now you can thoroughly cleanse your face with just cold water and this magical fibre pad. Washing your face clean with a wet pad, halo tech fibres hold onto the oil, grime and makeup to make sure that none of the dirt particles transfers back to your face. While we recommend a second cleanse to reach the deeper dermal layers, face halos are an easy, fuss-free and natural way to remove dirt and makeup, and the best bit, they work! With most brands of halo lasting up to 200 washes, this environmentally sustainable skincare solution is something that every girl needs. A cleansing brush is an electronic hand-held device designed to aid exfoliation, promote healthy circulation, reduce enlarged pores and massage your face. You can use with your choice of cleanser (of course, we opt for the most natural product) to remove grime and make up, stimulate skin cells and leave your skin smooth, bright and hydrated from the motion of the soft bristles. While quality is critical here and some of the cheaper models can cause more harm than good, we recommend using a cleansing brush with caution. Overuse can remove healthy cells and cause irritation and skin sensitivity which can lead to stinging and red patches. That being said, for an occasional deep clean, this tool works well and is likely to attract compliments on how good your skin looks. Don’t forget to wash the brush every few days to avoid bacteria build-up which can cause pimples or breakouts. A microcurrent facelift device is a handheld device that emits electrical currents to create a natural facelift. The micro current supposedly helps repair damaged cells to reduce dry patches, brighten skin, boost elastin and collagen production to reduce the signs of ageing, and promote blood flow to give an even tone. The results of toning your face at home with a facelift device are unquestionable however we can’t recommend this one. While we’d like to believe that these devices adhere to strict manufacturing regulations, anything that alters the cells natural processes is best left to a professional who can closely monitor any adverse reactions and prescribe personalised treatments. There’s no one-size-fits-all for skincare, so it’s always best to consult with a professional for treatments that change the appearance of your face, especially if you’re considering using electricity. Remember that any damage to your delicate skin cells may be permanent. A jade roller or face massage roller is a small hand-held device that looks similar to a miniature paint roller. 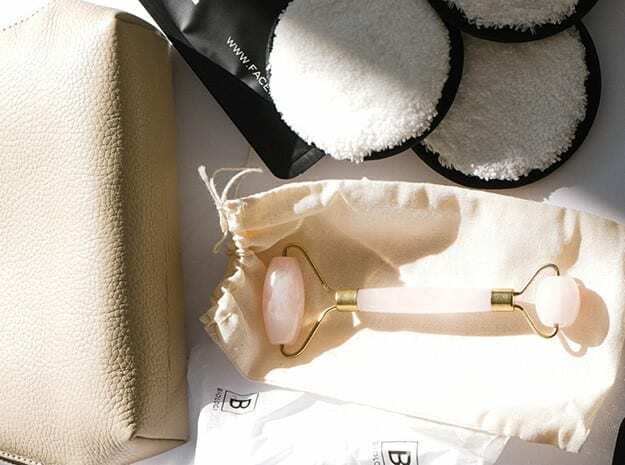 The original face roller is made from jade stone and was designed to reduce dark circles, reduce the appearance of wrinkles and improve circulation leading to a bright and even complexion. The jade roller massages the whole face with a smaller roller for the hard-to-reach areas such as under the eyes, and creates lymphatic drainage to move toxins away from the skin’s surface and back towards the liver for disposal. There are many skincare tools which are nothing more than gimmicks and their marketed benefits should be taken with a pinch of salt. If in any doubt, we always recommend consulting with a professional dermal therapist who can prescribe a treatment that suits your skin type and individual skincare concerns, so you get desired results.